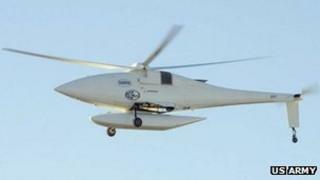 New helicopter-style drones with 1.8 gigapixel colour cameras are being developed by the US Army. The army said the technology promised "an unprecedented capability to track and monitor activity on the ground". A statement added that three of the sensor-equipped drones weredue to go into service in Afghanistanin either May or June. Boeing built the first drones, but other firms can bid to manufacture others. "These aircraft will deploy for up to one full year as a way to harness lessons learned and funnel them into a program of record," said Lieutenant Colonel Matthew Munster, product manager at the US Army's Unmanned Aerial System Modernization unit. The A160 Hummingbird systems are capable of vertical take-off, meaning access to a runway is not necessary. The army also confirmed that they have hovering capabilities - something its existing unmanned aircraft lack. Test flights will be carried out in Arizona at the start of the year before they are shipped to the Middle East. The drones will take advantage of the Autonomous Real-time Ground Ubiquitous Surveillance-Imaging System first deployed earlier this year. The Argus-IS's acronym was chosen to recall Argus Panoptes - the one-hundred-eyed-giant of Greek mythology. The technology is based on a 1.8 gigapixel camera - the largest video sensor used in tactical missions. It offers 900 times the number of pixels of a 2 megapixel camera found in some mobile phones. The system can provide real-time video streams at the rate of 10 frames a second. The army said that was enough to track people and vehicles from altitudes above 20,000 feet (6.1km) across almost 65 square miles (168 sq km). In addition, operators on the ground can select up to 65 steerable "windows" following separate targets to be "stared at". Vehicles, people and other objects can be tracked even if they move in different directions. "If you have a bunch of people leaving a place at the same time, they no longer have to say, 'Do I follow vehicle one, two, three or four,'" said program manager Brian Leninger ahead of the system's launch. "They can say: 'I will follow all of them, simultaneously and automatically.'" The equipment has had new antennas attached to it to optimise its performance on the new aircraft. Once the one-year trial is completed, the army said it planned to hold a "full and open" competition for defence companies to bid to build second generation vertical-take-off drones. It said the infrared imaging sensors would be sensitive enough tofollow "dismounted personnel at night". In addition, the upgrade promises to be able to follow up to 130 "windows" at the same time. The system's first test flight has been scheduled to take place by June 2012. Flightglobal's website has also reported that the trials will includethe use of stub wings"intended for carrying weapons". While the army discusses the advantages of unmanned drones offering valuable intelligence to troops on the ground, the programme has run into controversy. Pakistan has criticised drone strikes which killed 24 of its troops in November on the Afghan border.Previous attacks killed children. Iranian officials have also shown off a captured surveillance aircraft which they have refused to return to the US, demanding an apology for the "invasion" of their airspace.